Banners are perennial favorites of advertisers and marketers. This traditional printed marketing tool is universally used indoors as well as outdoors to increase visibility. This convenient marketing tool could be hung or erected in open areas, displayed in exhibition halls, or erected on a retractable banner stand in front of your kiosk. Banners could be of varying sizes and mounted on different kinds of frames as per your exact requirement. Banners have undergone several changes over the years. Earlier, cotton, satin, organza and canvas were used extensively. These were replaced by nylon and polyester for their lighter weight and easier availability. Presently, vinyl banners are most popular and are used universally for all categories. Vinyl is light in weight, water resistant, easy to print on and convenient to erect and dismantle. These could also be stored over longer periods for subsequent use. Vinyl is preferred over other substances because of it ability to adapt to different types of printing. These are compatible with digital printers and could be cut into customized sizes. As they are flexible they could be rolled or folded as per your requirement. This material is available in categories of 10oz., 13oz., 16oz., and 18oz. Among these 16oz. 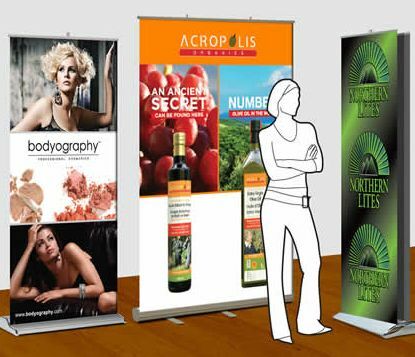 variety is ideal for a retractable banner stand. This being on the heavier side does not curl even when the edges are not sewn, fused, or welded. These banners are normally in form of roll ups or pull ups. They are easy to erect, roll in and carry. As the material used is made of vinyl the print quality stays intact for a long time. Though these vinyl printed material could of different heights and width, they are usually restricted to a height of 96 inches and width of 33 inches. Even after repeated use, your vinyl print out remains as good as new. Customization is another outstanding feature of this form of display. These stands could be chosen according to your need. Normally two variants are available: floor and table. Floor types could be put up inside exhibition halls, outside shop rooms, and at entrances of showrooms. Table top type might be displayed inside shop windows, small office spaces, and on shop room counters. Normally, banner designers always prepare a sample before making a final imprint. You must always insists on these proofs before finalizing an order. In case, your publicity material is placed inside the middle of a hall or a room, a dual-sided matter could be opted. This enables an omni-directional view of your placard. Although putting up and dismantling of these are easy, it is advisable to seek professional advice in the initial stages. If these point of sales materials are date or venue specific, you need to be careful about not using them in other places and in different dates. You must always remember that a retractable banner stand is meant to impress prospective buyers and motivate them in using your product or service.